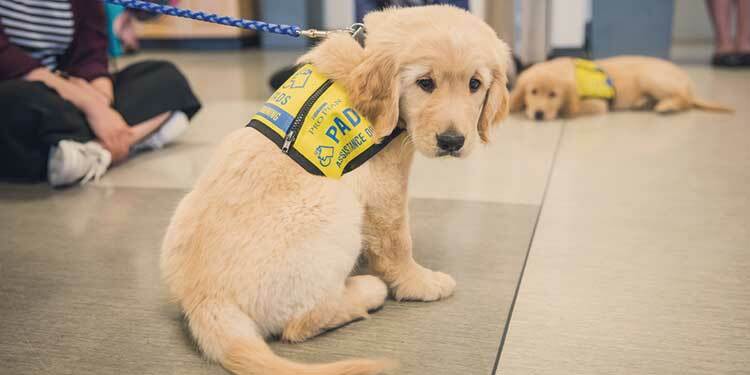 Offering pet relief areas for individuals travelling with assistance animals, YVR welcomes them, like Orville, currently being raised with a host family/host families. YVR currently sponsors three puppies in training, Orville, Wilbur and Amelia. With a record number of travellers expected through Vancouver International Airport, YVR works to add more accessibility to their facility. In March 2018, traffic was up more than nine per cent, making it the earliest month of the year where traffic exceeded two million passengers. No longer do we hide away differently-abled people. Paying more attention to the last word, “people” than any other descriptors, many facilities work towards inclusion and accessibility through universal design, intuitive design and new technology. According to KPU industrial design professor, Victor Martinez, intuitive design means putting things within easy reach in a spot where people would expect them to be. Martinez says this applies equally to a car’s control panel and the location of washrooms in a public facility. He also says, good design is invisible to the user. It just makes things easier to use, and use well. Subscribing to the philosophy that ensuring equal access is not offering special privileges, VYR builds in many aids to independent living with each renovation or new build. For instance, the acoustics designed to be calm also reduce the background din for those using hearing aids. Things that may go unappreciated to those with typical abilities are a boon to travellers. The flooring alone indicates YVR’s attention to detail. Different textures let your feet know where you are when your eyes cannot. The floors at YVR were designed with a tactile code. Tile or terrazzo indicates an exit is near, carpet indicates a gate is nearby, laminate flooring indicates a retail area and high contrast tiles let you know which way you are going. The textural differences do not happen by accident but are designed in to the very structure of the building with great forethought and planning. Understanding the subtleties of cues those with low or no vision standardly use for navigation, aids independence, helps people travel, and offers the dignity of way-finding on their own. Now, joining the host of things YVR is doing to level the playing field for travellers with physical or sensory challenges, is CHECKITXPRESS, the world’s most accessible, efficient and intuitive self-service bag drop. Using innovative design and technology, this will make it easier to figure out how to drop your bag and to actually send your luggage on its way. YVR’s technology hub, Innovative Travel Solutions, partnered with New Zealand-based Glidepath, a world leader in airport baggage handling, to develop CHECKITXPRESS seen pictured above. Universal design is an architectural attitude that designs out the barriers that can unconsciously be designed into a building’s plan. It means removing stairs or even single steps wherever possible, having buildings supported by walls rather than posts people can unexpectedly bump into, and smooth transitions between different types of flooring. It can include surfaces that are easy to roll a wheelchair on instead of thick carpet. When inclusion is the model, there can be unexpected consequences, positive consequences. The standard adaptations for those who use a wheelchair turn out to be ideal for tired moms with heavy toddlers in big strollers; the wheels roll easily; there are no steps to negotiate; elevators are where you’d expect them; washrooms are big enough to get into and the stalls accommodate not only the stroller or wheelchair but have a changing table all can use with dignity. People no longer consider themselves bound to a wheelchair but using a wheelchair. Just as eye glasses or cellphones are all ways of joining the world, those with differing needs of any kind expect to participate fully in what the world, and travel, have to offer whether it be at home, in the mall, or on an international voyage that starts at YVR.